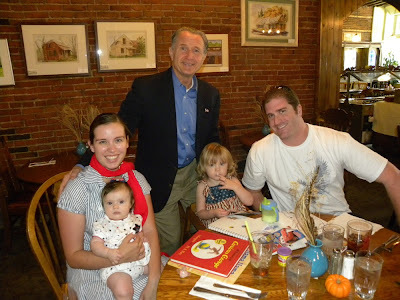 Someday I'll Sleep Autism Blogs: Lunch with Congressman Herger! I was very excited to get to go to a luncheon with Congressman Wally Herger today. He was visiting the Republican Woman's group that I'm part for lunch, and I was a little nervous to take both girls, but it went really well! He's a fun speaker to listen to and I brought a canister of mini m&m's to help keep Sadie's mouth quiet! I'm really glad the entire family was able to go! Here we all are!